Click here to get you to the main Hennepin County Lyndale reconstruction page. Click here to go directly to the Hennepin County page containing the specifics on sections of the avenue under construction. Finishing work on the rebuilt section of Lyndale Avenue between Minnehaha Parkway and 31st Street is expected to finish during this year's construction season. Work still to be completed includes repairing or replacing curb & gutter and sidewalk concrete that is cracked or broken; replacing starters in all street lights; and other minor corrections. The contractor will work on repairing the street light starters throughout the winter months. The concrete repair work is tentatively scheduled to be completed in May. The Minneapolis Park Board will install trees in the medians on Lyndale Avenue from 38th Street to 31st Street starting this spring. What types of trees are to be planted will be reported as that information becomes available. The City of Minneapolis has a list of the signs that still need to be installed. The city is responsible for installing all street signs. Please note that temporary lanes closures could be needed to complete some of this finishing work. Lyndale Avenue Reconstruction informational meetings will be held every 2nd Tuesday of the month at 6:30 p.m. at Painter Park. The next meeting will be held Tuesday October 13th. Our thanks to Painter Park for their generosity in providing the facilities for these meetings. Given the point at which things are at in the project this is likely to be the last of these monthly meetings to be held this year. If you have questions, concerns or comments on the project you can always contact Hennepin County Project Engineer Don Shaffer, (612-282-5538 / donald.k.shaffer@co.hennepin.mn.us), Kerri Pearce Ruch Policy Aide to Commissioner Gail Dorfman (612-348-3080/kerri.pearce.ruch@co.hennepin.mn.us) or your neighborhood organization office. Time: 6:30 p.m. - 7:30 p.m. The second year of this project which began in June of 2008 will feature road reconstruction between 38th Street and 31st Street and between Minnehaha Creek and 50th Street. Lyndale from 50th Street to 38th Street will have the last two inches asphalt placed along with the placement of the new signal lights and road and pedestrian level lights. The reconstruction project will reduce the number of traffic lanes to one in each direction for the majority of Lyndale from 31st Street to Minnehaha Creek and pedestrian level lighting will be added. From 38th Street to the Minnehaha Creek, bump outs will be introduced to provide protected street parking and eliminating for most blocks restricted parking. From 38th Street to 31st Street, center medians planted with trees and turf will be added. The pedestrian level lighting design uses a "high"/"low" system by which high "shoe box" light poles alternate with ornamental lantern-style pedestrian level lighting along each side of the Avenue. The placement of the final two inches of "wear" course from Minnehaha Parkway to the north side of 40th Street intersection was placed on Thursday August 27 and Friday August 28. Placement of bituminous on the milled portions of 50th, 49th, 48th, 47th and 46th streets was also completed. Three different types of material are being used to stripe the road depending its location. While some of the striping has been completed, one of the striping materials cannot be placed on the road until 10 days following the placement of the "wear" course. Because of this all of the permenant striping will not be completed until sometime after September 7. The specific date will be posted when it becomes available. The schedule for the placement of the first two layers of bituminous on the east side of Lyndale from 38th Street to 31st Street has been rescheduled. This work is now scheduled to occur Thursday September 3rd and Friday September 4th. More information on boulevard sodding for this section of Lyndale Avenue will be posted as it becomes available. The new signal lights at the 48th, 46th and 43rd Street intersections have been activated. The new street lights installed at these intersections were also turned on at the same time. Street lights between intersections will be turned on in September. The County and City are waiting for Xcel to complete work at the 50th/Lyndale and 40th/Lyndale intersections. Until this work is completed the new permanent signal lights at these intersections cannot be activated. Installation of the new 18 foot ornamental lights began two weeks ago. These are the shorter lights with the lantern style luminaries called for in the Lyndale Streetscape Committee (LSC) recommendations. The City Council approved these lights after receiving a lighting special assessment petition from property owners representing over 70 percent of the assessable area of the 2.2 mile roadway project. The alternating of the 30 foot high "shoe box" lights with the 18 foot "pedestrian level" ornamental lighting was the design approved by the LSC. The high/low lighting design later became part of the City's new lighting standard. Alternating high and low lights is a cost effective way to evenly light the roadway and the sidewalk and add to the aesthetic of the avenue while avoiding unsafe conditions for pedestrians that can be present in other lighting configurations. Both the high and low level lights are expected to be activated in September of 2009. Median noses, 10" interior median curbs, remaining carriage/out walks and other concrete work will be completed with the east side traffic lane and parking lane closed. Originally traffic was to be split with north bound traffic using the east side parking lane and south bound traffic using the west side parking lane as traffice lanes. Instead, traffic will temporarily be detoured to use the parking lanes on a temporary basis while the concrete work is done within the block. The contractor is responsbile for watering the new boulevard sod for 30 days after it has been placed. After the first 30 days, it is the responsibility of the property owner to maintain the boulevard sod. The 30 day calendar "clock" will begin for all sod placed on the east side of Lyndale between 38th Street and 31st Street after the last piece of sod is placed in the boulevards along this portion of Lyndale. The contractor is looking to place the final bituminous layer ("wear course") sometime during the first two weeks of October. More details will be provided as the schedule firms up. Striping will begin upon the completion of the placement of the "wear course". Yellow striping uses a special material that cannot be placed until 10 days after the final bituminous layer has be placed. This will no longer be the approached used. See the approach that will be used above. The the far east lane of Lyndale will be opened for traffic heading north bound. The far west lane of Lyndale will be opened for traffic heading south bound. The two center lanes will be closed while work on the medians is conducted. This traffic lane switch is currently expected to occur the week of September 14. Three 20' "shoe box" lights still need to placed between Minnehaha Parkway and 40th Street. These shorter non-ornamental lights are needed due to the height of power lines at the designated location of these three street lights. Wooden poles used only for street lighting will be removed from the avenue. Three different types of material are being used to stripe the road depending its location. Two of the three types of striping material have been placed. White striping delineating things such as turn lanes and parking lanes. The section of 50th Street between the east side of the Lyndale/50th intersection and the west side of the Aldrich/50th will be milled and paved. Work is scheduled to begin Friday August 14, 2009. There will be no parking on this section of 50th Street during the milling work which is expected to be completed August 17th, 2009. A portion of the curb and gutter on the south side of this block of 50th Street will be removed and replaced August 10th and August 11th. During this same time small portions of 49th Street, 48th Street and 47th Street will also be milled between where each abuts Lyndale and the road resurfacing work that was done on them by the city during last summer (2008). All milled road will have a new layer of bituminous (asphalt) placed when the "wear" course is placed on Lyndale between Minnehaha Parkway and 40th Street. The wear course placement is scheduled to begin August 18th, 2009 and is scheduled to be completed August 19th. Please Note: Parking on both the north and south sides of the 50th street between the west side of Lyndale and the east side of Aldrich will be permanently eliminated and replaced with traffic lanes when this road work is completed. Please contact Hennepin County Project Engineer Don Shaffer, (612-282-5538 / donald.k.shaffer@co.hennepin.mn.us) or Kerri Pearce Ruch Policy Aide to Commissioner Gail Dorfman (612-348-3080/kerri.pearce.ruch@co.hennepin.mn.us) with questions or concerns. 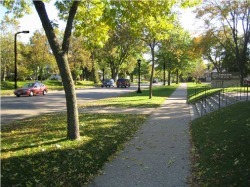 Prior to placing the last two inches of bituminous "wear" course from Minnehaha Parkway to 39th Street, new trees and sod have been placed in the boulevards on Lyndale from 50th Street through 39th Street and on the west side of the avenue on the 3800 block during the second half of this month. (The east side of Lyndale on the 3800 block is being used used by the contractor as a staging area so sod cannot yet be placed on boulevards there yet. Sod will be placed where the field station is next to Bethlehem Lutheran church after the office is removed.) Tree planting by the Minneapolis Parks and Recreation Board begin the first week of June. Shafer Contracting, the firm doing the road reconstruction, is responsible for the sod during the first 30 days after it is placed. The property is owner is responsible for its care after the first 30 days. City ordinances govern what can be planted in the boulevards. A photocopy of the relevent ordinance can be downloaded here. If you have any questions concerning what is allowed to be planted in the boulevards please call 311. Road road removal on the east side of Lyndale between 38th Street and 31st Street is planned to begin on Monday, July 13. If you have plantings in the boulevards you would like to keep you must move them to another location in order to not have them damaged by the construction work by Monday. More information on when it is safe to move your plantings back into the boulevard will be posted here as soon as it becomes available. During the closure of Lyndale between Minnehaha Parkway and 50th Street, buses followed detour routes. The normal routes for the #4 resumed on June 5 when this section of Lyndale reopened. The section of Lyndale Avenue from Minnehaha Parkway to 50th Street which has been closed since April 20 of this year will reopen today, June 5 by 3:30 p.m. This includes the bridge over Minnehaha Parkway. The new permanent signal light at the 50th & Minnehaha Parkway intersection will be activated and MTC buses will return to their normal routes this afternoon. The road material folks will be driving on is the same that between 50th Street and 38th Street. The final two inches of "wear" course that will bring the road flush to the curb/gutter and driveways will be placed later this summer. When the wear course is placed, the road will maintain one traffic lane in each direction; it will not be closed. If you live on Lyndale Avenue between 38th Street and 31st Street you be hooked up to temporary water by May 8. Many of you are already on temporary water. We compiled the collective experience of residents like yourselves in creating the steps of being hooked up and disconnected from temporary water from a residents point of view. You can download those steps here. Please note this is not official documentation from any government agency. If you have any questions regarding temporary water, please contact the City of Minneapolis Water Works, Maintenance Division at 612-673-5600. The intersection of 38th and Lyndale is scheduled to be closed for up to 10 working days beginning May 11. The intersection needs to be closed in order to do utility work under and around the intersection. Detour signs will be posted during the closure. If you have questions, concerns or comments on the project you can always contact Hennepin County Project Engineer Don Shaffer, (612-282-5538 / donald.k.shaffer@co.hennepin.mn.us), Kerri Pearce Ruch Policy Aide to Commissioner Gail Dorfman (612-348-3080 / kerri.pearce.ruch@co.hennepin.mn.us) or your neighborhood organization office. The construction kick off meeting for road reconstruction between Minneahaha Parkway and 50th was held on April 23rd. 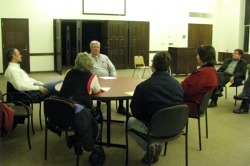 The meeting was held at Richfield United Methodist Church from 7:00 p.m. to 8:00 p.m. Commissioner Gail Dorfman and Hennepin County Transportation and City staff were on hand to present the construction time line and answers questions. Our thanks to Richfield United Methodist Church for their generosity in providing the facilities for this meeting. Lyndale Avenue from 50th Street to Minnehaha Parkway will be closed beginning Monday, April 20th and remain closed for no more than 25 "working" days. Working days means just that; those days the construction folks are able to do their work. As such the reopening date is weather dependent, but every effort is being make sure the road is open before the weekend of May 23rd including scheduling work to be done on some Saturdays. Minnehaha Parkway will be closed at Lyndale Avenue the week of April 20th. It will reopen after that as construction work allows. Even when the road at that intersection is closed, a path for bicylists and pedestrians will remain open and protected from construction work. The City and County are still planning to credit $35,000 of CARAG NRP funds to offset the new lighting special assessment costs for CARAG property owners living on Lyndale. The special assessment for the new street lighting will appear on property tax bills either in 2010 or 2011 depending on the completion of the lighting project. This special asssement is separate from the road reconstruction assessment. NOTE: This credit applies only to properties on Lyndale in the CARAG neighborhood. It does not apply to properties in other neighborhoods. The cross streets from 38th to 31st will remain open for the duration of the project. There may need to be a day when a cross street is closed to do utility work underneath the intersection. Such work should not lead to the cross street being closed for more than a single day. The contractor will work with nearby businesses in these cases. Where is My Protected Parking? Property owners living on the east side 3800 and 3900 blocks of Lyndale will need to wait to use the new protected parking areas on Lyndale until road reconstruction work from 38th Street to 31st Street has been completed. Shafer Contracting, the contractor responsible for the road reconstruction work, will be using the protected parking bays on the east side of these two blocks as a staging area for construction equipment for the road work being conducted north of 38th Street this year. Road construction work is planned for completion this Fall. 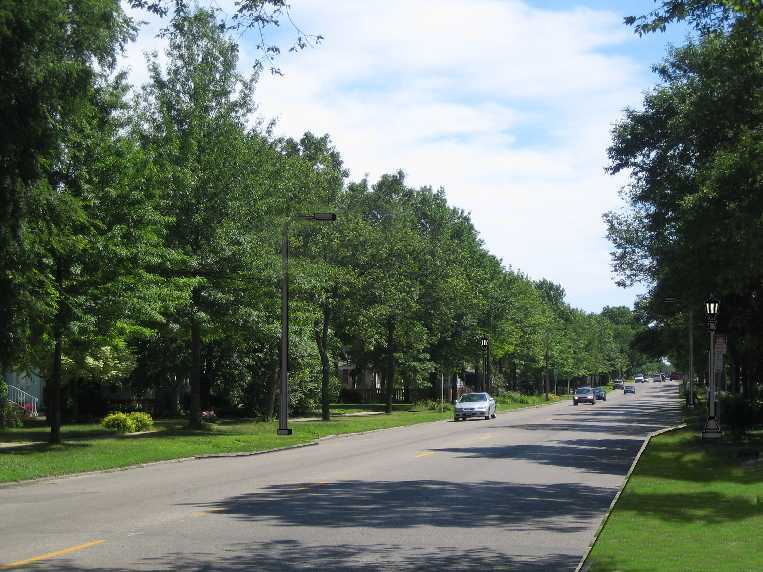 Eight trees will be removed on the west side of Lyndale Avenue on or around March 26th. All eight trees to be removed are on the west side of the 3100 block of Lyndale Avenue. Trees to be removed have been marked with a red "R" on the trunk of the tree. 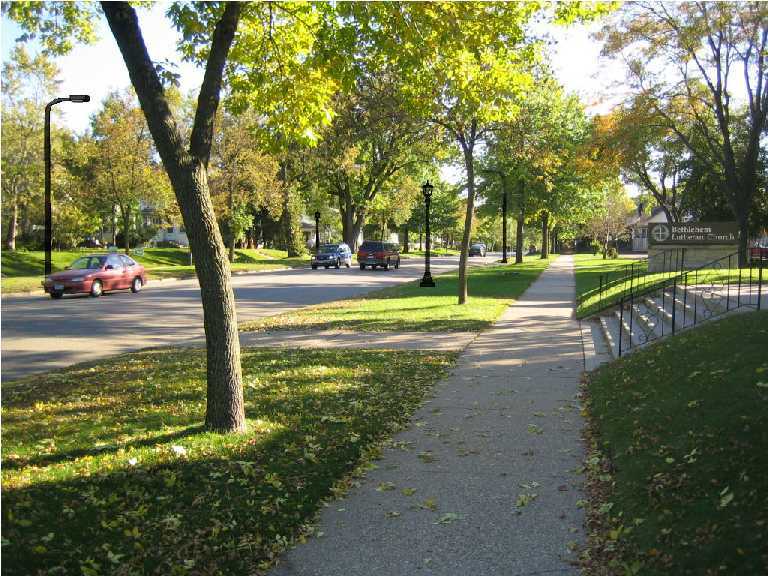 The trees are to be removed permanently as part of the road reconfiguration which will reduce the width of the boulevard between the curb and the sidewalk on the west side of 3100 block of Lyndale. Hennepin County's Senior Project Manager, Don Shaffer, has provided an update to the schedule for the installation of the street and signal lights. The installation of the street lights, both the 30' "shoe box" lights and pedestrian-level orinmental lights, will be completed by late spring / early summer of 2009. The permenent signal lights will be installed by mid-summer of this year with the exception of the new 38th and Minnehaha Parkway signal lights. 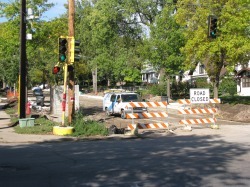 The new signal lights at the 38th and Minnehaha Parkway intersections of Lyndale will be installed at the end of 2009. The new signal lights will be installed at all intersections that previously had signal lights for this stretch of the avenue. These would be at the Lyndale Avenue intersections of Minnehaha Parkway, 50th Street, 48th Street, 46th Street, 43rd Street, 40th Street and 38th Street. The signal poles were delivered in mid January and the contractor is expected to start working on the light and signal poles in the next few of weeks. The contractor has completed all the work possible during the winter months. Lyndale Ave So Between 50th & 38th Streets Reopens! Lyndale Avenue has been reopened to through traffic after being closed for reconstruction since June 8th of this year. Road reconstruction, relining of the water main, replacement of the gas main and gas services, new sewer, new curb and gutter featuring protected parking bays, new driveway aprons and carriage walks and temporary striping of the road were all completed. The road officially reopened on Wednesday November 26th. Please watch our short Lyndale Reconstruction video below! The section of Lyndale between 50th and 38th reopened today Wednesday November 26th! Through traffic is now using the Lyndale. Cars are already taking advantage of the dedicated left hand turn lanes and the protected parking bays. All of the detour and road closed signs have been removed including those present on the section of Lyndale from Minneahaha Creek to 50th where gas main work was conducted this year. If you have a chance, take a drive down this newly reconstructed and reconfigured section of Lyndale. It is quite a pleasant drive. While the pedestrian lights are not up yet, it is clear the road has taken a step closer to being a neighborhood avenue. The new lighting system, including the pedestrian level ornamental lights, will be installed over the winter. The final two inches of the "wear course" of the road will not be placed until late June/early July 2009 since its placement requires warm air temperatures. When it is placed one lane of traffic in each direction will be maintained. In 2009, Lyndale Avenue from 38th St. to 31st St. and from Minnehaha Parkway to 50th St. will undergo reconstruction to finish the road work portion of this project. Temporary striping will be put down with the permanent striping placed after the final wear course is placed next summer. The boulevards will be filled with dirt and covered to prevent erosion during the remainder of this fall and winter. Sod will be placed in the spring of 2009. The intersection at 38th and Lyndale will be closed October 28th and October 29th. The closure is necessary in order to install storm sewer and a large manhole. Posted signs will detour traffic west bound on 38th to Nicollet Avenue to 36th Street to Dupont Avenue to 38th Street. Traffic traveling east bound on 38th will follow this same route in reverse. The 50th Street and Lyndale intersection closed Thursday, October 9th. It will reopen Thursday October 23rd before 5:00 p.m. Traffic is being detoured on 54th St west to Penn Ave and on Diamond Lake Rd east to Nicollet Ave.
During this period of closure gas main work will be conducted, sewer will be installed, new curb and gutter put in, class 5 and binder placed (all of the road material except the final two inch "wear course") and the installation of temporary signal lighting. When the intersection reopens on October 23rd it will look very much like it will when the road project is completed. Temporary signal lighting will remain until the new signal light is installed during the January/February 2009 time frame. The new lighting system, including the pedestrian level ornamental lights, will also be installed over the winter. 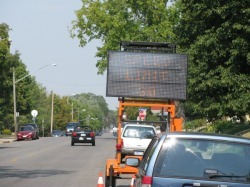 The County has placed "Local Traffic Only" signs at 51st and Lyndale due to traffic spill over from the posted detours. Additional traffic enforcement has been requested. The speed wagon that was located on the southbound side of the 4600 block of Bryant Avenue was located on the eastbound side of 38th Street last week (10/13/08). The speed wagon no longer appears to be in our area. The city's Traffic Division has received many calls with concerns about the speed of traffic on our streets due to the Lyndale reconstruction unofficial detours. In response to this, speed wagon #6 will be be rotated weekly on those roads where there are significant numbers of 311 calls reporting traffic traveling at unsafe speeds for existing conditions. We are looking into how a particular block is chosen from among these roads. We will continue to work with the County and City on options to have more speedwagons in the area. Residents report they are effective. The best way to keep this speed wagon in our area is to call 311 when you see traffic traveling at speeds unsafe for existing conditions. You can also make a request through the city's website by clicking here. Note: A speed Wagon is a reader board that measures and displays the speed of an approaching car. The display of the speed of the car provides an incentive for the driver to slow down. The speed wagons used by the City of Minneapolis are battery powered with solar panels to provide a charge to the battery so they must be positioned where there are no obstructions above them such as trees. The City has a very limited number of speed wagons which are used througout the city. City speedwagons typically stay one week at a location before being moved. Next Lyndale Reconstruction Neighborhood Meeting November 11th! Residents, businesses and others affected by this road project are encouraged to attend this neighborhood meeting for the reconstruction of Lyndale Avenue. Hennepin County staff will be on hand to answer questions and hear concerns regarding the reconstruction project. Please note: These Hennepin County Transportation meetings are held regularly by Don Schaffer, the Project Engineer for this project. They are held the 2nd and 4th Tuesday of each month. Our sincere thanks to Bethlehem Lutheran Church for their generosity in providing the facilities for these meetings. A number of people have asked if garbage pick up will continue during the reconstruction of Lyndale Avenue. The answer is yes! Please note: Garbage and recycling pick up times can be as early as 6 a.m on the blocks of Lyndale under construction. This is necessary in order to get to the garbage and recycling containers before the day's construction begins. All other garbage pick up issues should handled by calling 311. We are continuing to work with County Transportation staff to have the signs indicating the "Road Closed to Through Traffic / Local Traffic Only" placed at each intersection on Aldrich and Garfield on the north and south sides of these two avenues in addition the signage already present on the cross streets. The County is required to keep the "Road Closed to Through Traffic" signs to the side of the road. The County has asked residents to please not move these signs to the middle of the road. "Please Slow Down - We Live Here" yard signs are appearing on many of the blocks affected by the increase in traffic from the Lyndale reconstruction project. Over 60 signs have been placed on Garfield, Aldrich, Bryant and other streets affected by the road reconstruction project. Signs are still available!! The more signs on a block the better! The display of lots of these bright yellow signs show drivers we care about the safety on the streets of our neighborhoods and are that we are watching. Getting traffic to travel at safe speeds during this road reconstruction period will not be solved by one government entity, one elected official or one neighborhood organization. It will take everyone, working together, to keep traffic traveling at safe speeds until the road reconstruction has been completed. To get a Slow Down yard sign please contact your neighborhood organization: East Harriet Farmstead Neighborhood Association, Lynnhurst Neighborhood Association, Kenny Neighborhood Association or Tangletown Neighborhood Association. 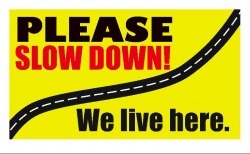 Please join your neighbors and put up a Slow Down yard sign! The East Harriet Farmstead Neighborhood Association has contacted County Transportation officials to alert them cars are driving on the closed section of Lyndale Avenue until they come upon the large barricaded hole at the 44th Street intersection which is unmarked by lights. We have requested that "Road Closed - Local Traffic Only" signs be put back up on Lyndale Avenue at the 43rd intersection and every intersection north to 38th Street (including the 40th Street intersection) until it is clear that section of road is indeed under construction. More information will be posted as it becomes available on this issue. Each section provides information pertinent to its part of the project currently being worked on. For example, the 38th Street to 44th Street section lists the procedural steps residents can expect when the city installs temporary water. Each section also includes useful dates to be aware of such as when the the cleaning and relining of the water main from Minnehaha Creek to 50th Street is expected to be completed (August 11th). Click here to go directly to the Hennepin County page containing the specifics on each section. A speedwagon (mobile sign that display the speed of the oncoming car) has been placed on the south bound side of the 44th block of Bryant. The City's Traffic Division owns and manages the city's speedwagons. Due to the scarcity of these units, they can only remain at a location for one week before they are moved. If you live on Grand, Garfield, Aldrich or Bryant, calling 311 to report increased speeds and unsafe conditions as a result of the traffic will help get speed wagons on your street. This Wednesday, August 6th, Lyndale Avenue from 38th to 43rd will be closed for construction. With the closing of that section, Lyndale will be closed from 38th to 50th. As with the already closed sections of Lyndale, the cross streets will still remain open to local traffic. The signal lights at 40th Street and 43rd Street will be removed during the reconstruction of this section of the project. The new signals at 40th Street, 43rd Street and 46th Street will be installed when the new lighting system is installed. A date for installation for the new lighting system has not yet been finalized due to a back log by the vendor responsible for manufacturing the metal the street lighting will use. The signal lights at 50th and 38th will remain in place while this section of Lyndale Avenue is under construction. Milling of the section of the road from 38th Street to 43rd Street will begin once it has been closed. On Monday, August 11th, concrete removal will begin and gas and water crews will begin their work. The section of Lyndale Avenue under construction from 38th Street to 50th Street will be paved this year. Paving and the installation of new curbs and gutters is planned to begin in September and be completed by the end of this year’s construction season. Please note: The paving of the road this year will include 3 inches of “base” and 2 inches of “binder”. This material can be driven just like the black top on a finished road. Next year, the final 2 inches of “wear” will be applied to complete the paving of the road. Starting on the north side of 50th Street construction crews will be starting to do underground work. This includes installing new sewer lines and the replacement of weak subgrade material. Two feet deep trenches will need to be dug to replace the weak subgrade. Work of this nature will begin on the 50th block and move northward. If you observe suspicious activity on the construction site after crews have left please call 911. Squads have been seen by residents traveling through the construction site, but you and your fellow residents are the best “eyes on the street”. When you do call, please ask for the incident number. This can be useful in finding out what resulted from your call. If you live on Grand, Garfield, Aldrich or Bryant, calling 311 to report increased speeds and unsafe conditions as a result will help your neighborhood organizations and elected officials to get speed wagons (mobile signs that display the speed of the oncoming car) placed on your street. As with 911, please request the incident number in the event tracking the response is required. Lyndale Avenue Reconstruction informational meetings will be held every 2nd and 4th Tuesday of the month at 6 p.m. at Bethlehem Lutheran Church. The first meeting was held this past Tuesday, July 29th. Our sincere thanks to Bethlehem Lutheran Church for their generosity in providing the facilities for these meetings. Residents, businesses and others affected by this road project are encouraged to attend. Hennepin County staff will be on hand to answer questions and hear concerns regarding the reconstruction project. If you have questions, concerns or comments on the project you can always contact Hennepin County Project Engineer Don Shaffer, (612-282-5538 / donald.k.shaffer@co.hennepin.mn.us), Kerri Pearce Ruch Policy Aide to Commissioner Gail Dorfman (612-348-3080/kerri.pearce.ruch@co.hennepin.mn.us) or the EHFNA office (612-824-9350/info@eastharriet.org). A speed Wagon is a reader board that measures and displays the speed of an approaching car. The display of the speed of the car provides an incentive for the driver to slow down. The speed wagons used by the City of Minneapolis are battery powered with solar panels to provide a charge to the battery so they must be positioned where there are no obstructions above them such as trees. The City has a very limited number of speed wagons which are used througout the city. Speed wagons were placed on Aldrich Avenue and Bryant Avenue the week after Lyndale Avenue closed for construction. A speed wagon was placed on the south bound (west) side of the 44XX block of Aldrich on July 22nd. EHFNA has requested two speed wagons, one for Aldrich Avenue and one for Bryant Avenue, starting on August 6th. The one on Bryant Avenue will be placed on the south bound side (west) of the 44XX block. The one on Aldrich Avenue will be placed on the south bound side (west) of the 43XX block. We will making another request for placement on these streets once school begins. With the closing of the 50th through 43rd blocks of Lyndale, residents and business owners have seen an increase in traffic not only on Bryant, but Aldrich and other streets in our neighborhood. Residents have also reported this extra traffic has brought with it higher speeds. The primary concern is safety and we can all contribute. The neighborhood association has been doing a number of things to address this influx of traffic. You can help with traffic safety issues by being more cautious as you drive, bicycle and walk through our neighborhood. You can also help by calling 311 to request a speed wagon for a specific street and block where you feel one is needed. If you have concerns or other ideas on how to increase the safety of our streets during this project, please contact us at 612-824-9350 or info@eastharriet.org. A construction kick off community meeting was held on Tuesday, April 15 at Bethlehem Lutheran Church to share information with residents about the Lyndale Avenue Reconstruction project which begins this summer. Commissioner Dorfman, who championed this project, was there along with Hennepin County Transportation and City staff to present the project's design, construction timeline and the strategy for communication with residents and businesses while the avenue is under construction. Click HERE to view a handout from the meeting which provides an overview of the project, the schedule, and contact information. Click HERE to view a letter from Gail Dorfman officially announcing the start of the project dated March 14, 2008. If you have any questions concerning this project, you can contact EHFNA Coordinator Emily Winter (612-824-9350) or EHFNA Chair Matt Perry (612-839-3320). Simulation: Proposed Lighting as viewed from the corner of Lyndale and 41st Street looking south on Lyndale Avenue. Click on the picture for a larger view of the image. This simulation was created on June 22nd, 2006 for the Lyndale Avenue Streetscape Committee to give an idea of what the lighting design and bump outs for protected parking could look like. This does not show the actual placement of lights or bump outs. Simulation: Proposed bump outs for protected parking as viewed from the corner of Lyndale Avenue and 38th Street looking south on Lyndale Avenue. This simulation was created on June 22nd, 2006 for the Lyndale Avenue Streetscape Committee to give an idea of wha the lighting design and bump outs could look like. This does not show the actual placement of lights or bump outs. Lyndale Avenue is a County road which is mainted by the City of Minneapolis. You can find the latest information on the project as well as many other supporting documents at the Hennepin County Lyndale Avenue Project website. A partial list of the documents found at this site include the original Lyndale Avenue: A Vision document which is part of the City's Comprehensive Master Plan, revised bus locations for this part of Lyndale Avenue and the final approved road layout.